So things have been a bit tight on the schedule lately. I had some travel for work and of course plenty of family things going on the last couple of weeks. 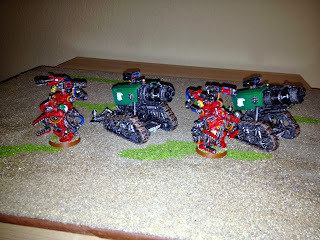 I did get an evening over at Frontline this last weekend, and I got a 40k game and a Fantasy game, both of which you can see on the Frontline site. Both games were fun, we screwed up the scouting in the 40k game but with both armies movement it really wasn't too game changing. The rest of my time for the hobby has really been all about prepping the last of this Marine army for Feast of Blades. The guy on the left is going to be Khan. 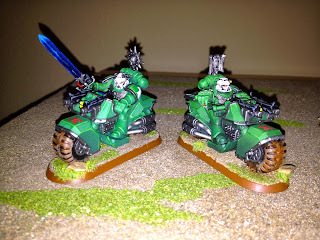 This model was painted from the ground up, so I did my best to match the original scheme and as you can see by looking at the Chapter Master on the right it is pretty darn close. Not perfect but I'm not sure someone would be able to pick it out if not told. I also changed the CM helmet to white to help him and the HQ selections stand out a bit more. You can see on these and the other bike pictures I've also added the red X decal to the front of the bike. I felt there needed to be a bit more color to break up the model a bit. A second Storm Talon, again being painted with Airbrush at a different time makes it really hard to match the paint. It is again pretty darn close but not perfect, though with this terrible picture it is really hard to tell. So I bought a bunch of these 3rd party resin gun to use as Grav Guns and I think they work well. 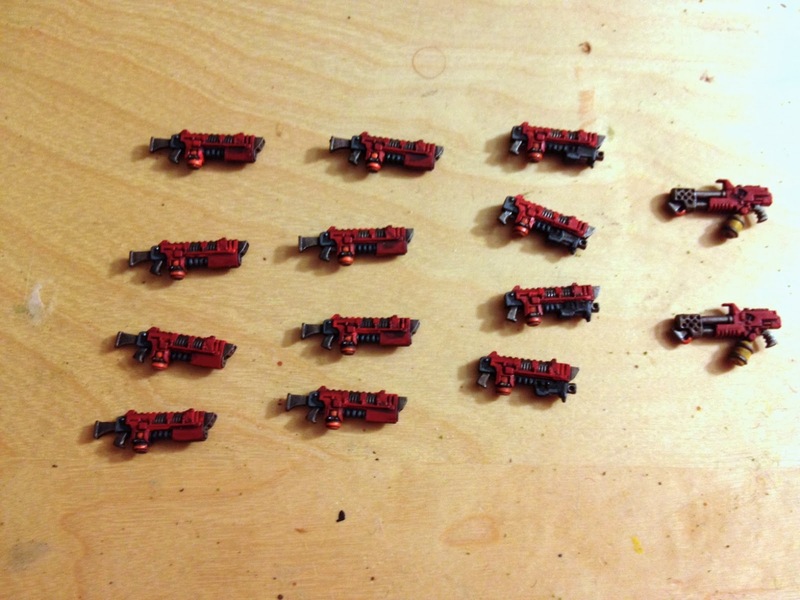 That's 8 of them on the left, then I cut 4 of them up and mashed them with bolt pistols for Combi Gravs, and then did up my two flamers at the same time. 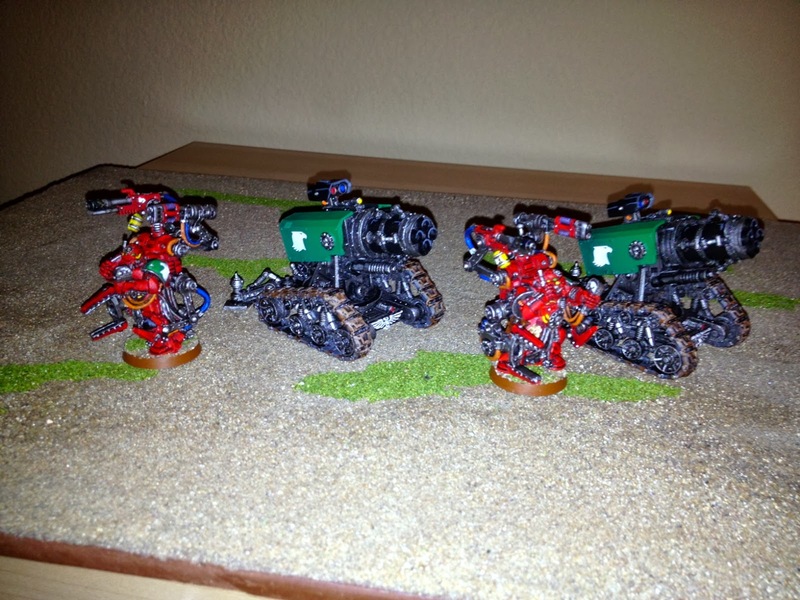 The Thunderfire Cannons and Techmarines I'm really pleased with how they turned out in the end. 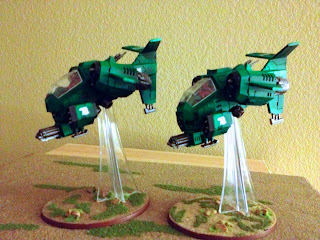 I was originally thinking I'd paint the Techmarines green like on the boxes but I had been painting the pilots of the Storm Talons all red so I thought I'd keep that going. In the end I think they are looking great and are really striking in the largely green army. Likewise I finished up the Apothecary and the Command squad. The all white on the bike I used the same method that I was using on the helmets. Quite honestly it doesn't work as well on the larger flat surfaces of the bike but it is good enough I suppose. Again the largely white bike stands out a lot form the green army! 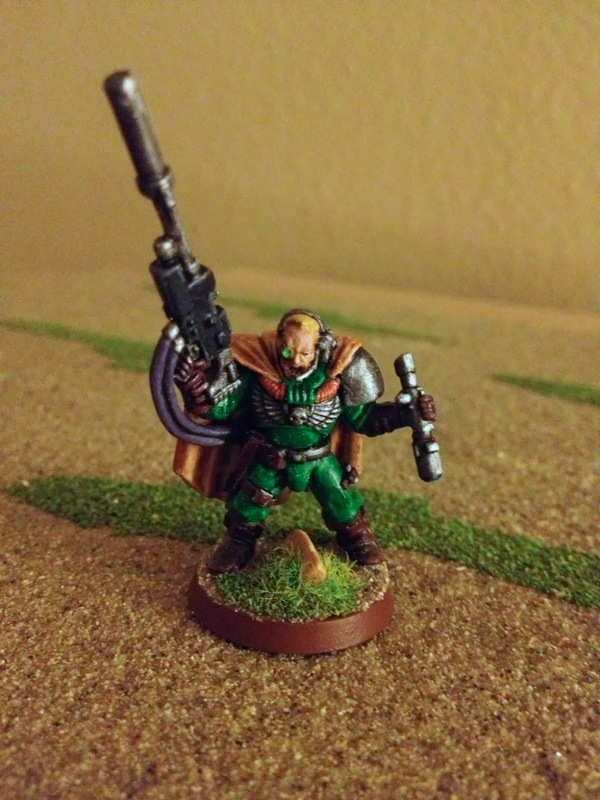 I needed to do a Scout Sargent since I'm no long using Telion, so I knocked this guy out one evening. 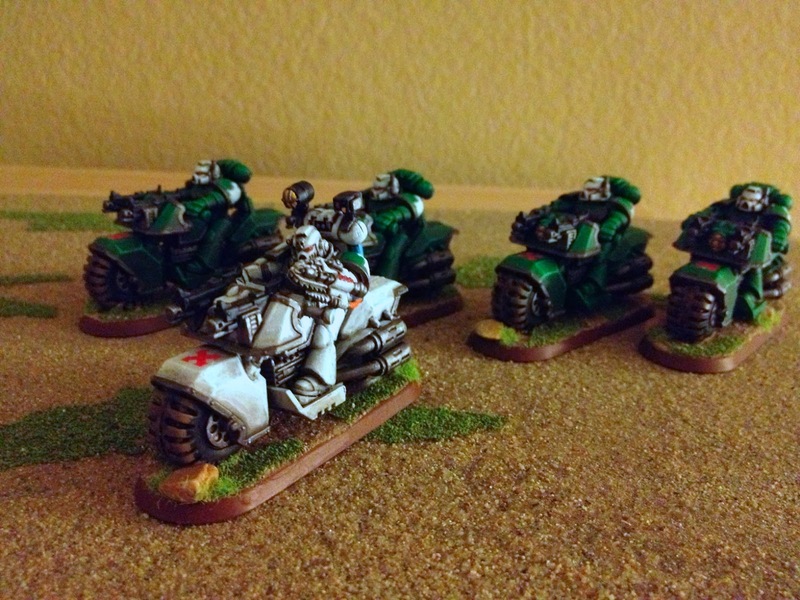 And though I already had a display board for the bikes I've made a smaller one I can fit in my carry on luggage. Everything fits on here but it is ridiculously tight. 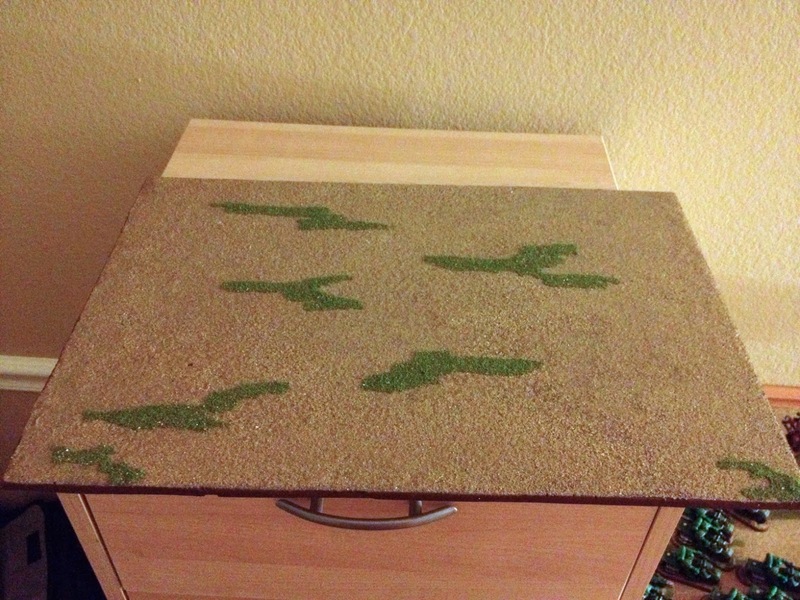 There wasn't much point to flocking a ton because the army covers 98% of the board I'd say! So with that I'm pretty much ready to leave Friday and have a couple of fun days of gaming. I'm expecting to do terribly but hoping that all my games are enjoyable and I meet some new players! I'll TRY to remember to take some pictures of the events!